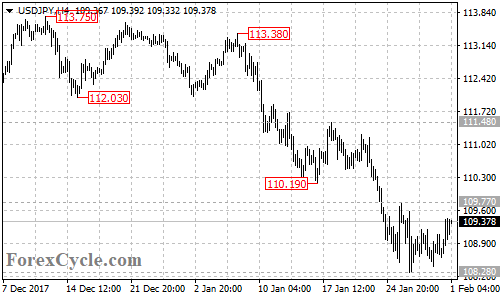 USDJPY is forming a sideways consolidation in a trading range between 108.28 and 109.77. As long as 109.77 resistance holds, the downtrend could be expected to resume and another fall towards 107.31 is still possible after the consolidation. On the upside, a breakout of 109.77 resistance will suggest that the downtrend from 113.38 had completed at 108.28 already, then further rise towards 111.48 could be seen.